Treating skin conditions and the signs of aging can rejuvenate your skin and enhance your appearance. With a chemical peel from the skin care specialists at Arden Wellness Body Contouring in Hauppauge, New York, you can address concerns like acne, age spots, discoloration, and uneven skin tone. Learn which type of chemical peel is right for you. Call the office for a consultation with one of the medical spa experts, or request the next available appointment that fits into your schedule, including evenings and weekends, using the online system. A chemical peel uses a safe chemical solution to remove the damaged outer layers of skin from your face, neck, or hands. Most women and men get chemical peels to improve the texture and tone of their facial skin and remove the damage left behind after years of sun exposure, acne, or the aging process. 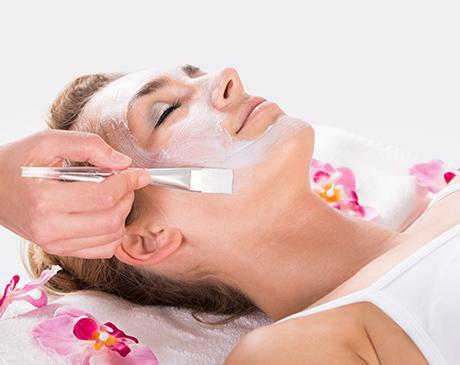 A chemical peel is a cost-effective way to dramatically improve your skin. What types of skin concerns can a chemical peel address? Chemical peels reveal a healthier layer of skin by removing the outer layers, depending on which type of peel you get. You can receive a light chemical peel, a medium peel, or a deep peel. Each is meant to address different skin concerns, and the deeper of a peel you choose, the longer your skin may take to recover after treatment. After a light chemical peel, known as a “lunchtime” peel, it takes one to seven days for your skin to fully heal. Immediately following your treatment session, your skin appears red. As the redness dissipates, you may develop scaly or peeling skin, as if you have a mild sunburn, but this generally improves within three to seven days. Moisturizer and sunscreen can help minimize the aftereffects of a light chemical peel. For optimal results, you can schedule multiple light peels every two to five weeks. After a medium peel, your skin is red and swollen for the first 48 hours following treatment. Blisters may form on the surface of your skin and crust and peel off over the following 7-14 days. You’ll need to soak your skin daily and apply ointment as instructed by the team at Arden Wellness Body Contouring. A deep peel can take 14-21 days to completely heal, and you’ll have bandaged skin immediately following treatment. You soak your skin daily and apply appointments and take antiviral medications as instructed by the team at Arden Wellness Body Contouring. This is the most intense type of chemical peel and not commonly prescribed. Generally, you can achieve the results you desire with light or medium peels. Talk to the skin care experts at Arden Wellness Body Contouring to learn more about which type of peel is best for your needs. Call the office or use online booking to schedule an appointment today.